Home > BJP > Leaders > Politics > Thoughts > In Hindsight - NaMoMania : Mirage or Reality ? In Hindsight - NaMoMania : Mirage or Reality ? Most candidates credit their losses or wins in 2014 elections to Modi Wave. What exactly is this wave and how did it start? 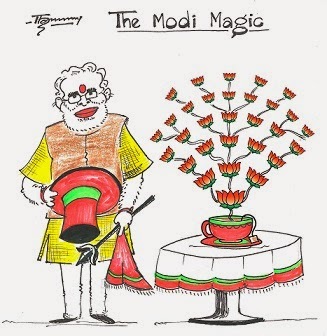 Read on to know all about NaMoMania - the Modi Magic!! There are over 1600 political parties in India out of which 47 are state level and 6 are national parties. One of them last week won an election after securing 282 seats on its own and 336 along with its allies. This for a country which has for last 30 years, seen a coalition government. A government depending on regional parties carrying enough weight to earn a veto power over the central government. However we as a nation spoke – enough is enough. Today we need a stable, strong and decisive government. Now we do not know if the government would be strong or decisive, but the electorate cannot be blamed now. All they could give to the government was stability and that they did. However, one would need to wonder how did this party called the Bhartiya Janta Party rose up to such a marvelous performance. Many do credit Mr. Narendra Modi, the Prime Minister designate today, with this success and there is no doubt he did have a very big role in driving this election to BJP’s doors. He came out as a unifying figure for the cadre, a symbol of development, a proponent of progressiveness and a ray of hope for the country. All this combined with the dismal performance of the incumbent Congress government and lack of an alternative gave boost to his image and made masses incline towards believing in the dreams and aspirations he showed. When I look behind last few months, here are some of the observations which clearly seem to be the foundation of his campaign. There is no substitute of hard work. This guy has tirelessly stretched himself to the core to reach out to the electorate. 440 election campaign rallies covering over 3 lakh kilometers across the breadth and length of the country is not an easy task. Compare it to the second largest such number which is something around 150 by “Yuvraaj” of the party with the incumbent government. Working continuously over long days and short nights (mostly limited to 3-4 hours) is one of the critical reasons how the guy took his message directly to masses. All this was done while ensuring that he is in the state capital every night to attend to the business as a Chief Minister. It was in 2002 when the opposition started the campaign to put up the communal tag on this guy. It was definitely an unfortunate incident and NaMo did fail a part of the society by not being able to do enough. He tried to clear the air that it was not an intentional act but the situation that led to what happened. However within a couple of years, he realized that he could not fight the communal battle and probably would have to live with the tag. It was then that he decided to go the development way. When the sole point of opposition was his communal image, he took on the taking Gujarat on path of development as he foresaw that this was the only plank which could take him further and could dampen the tag stamped on him. The guy is simply a master of creating perception. Though I agree that he has done a lot of great work in Gujarat but in today’s world just doing good work is not enough. Taking that good work to the masses is an art and this guy perfected that art. When the opposition was oblivious of his intentions or was busy spending energy in “communalizing” his image, he started selling the image of Gujarat – a progressive state with industry friendly environment. This caught the fancy of business and masses equally. No one even considered raising question on his claims for quite long and by the time they woke up, it was actually very late. People of this country by then had accepted the image of Gujarat as NaMo showed it to them and story of development of Gujarat was written on stone. It was this perception he built his entire image on and en-cashed it during the national elections. While the opposition had to work hard to challenge his claims which by now were considered a gospel’s truth, the guy was busy selling aspirations of India becoming Gujarat. And for this use of short catchy one liners was definitely interesting when “Abki Baar Modi Sarkar” and “Achche din aane wale hain” caught fancy of young and old alike and became words of use in everyday life. Just being clear on what you want to do and say is not enough. You need to be able to articulate it well enough that the people understand your vision, relate to it and are ready to rely on it. In all his speeches, interviews and interactions, NaMo showcased clarity of thought and will to convert thoughts in action. He may not have told people his implementation roadmap or list of activities but he highlighted the end goals. And the way he told that was perhaps convincing enough. No person opposing him was as great an orator as he was. Leader of the main party opposing him was pathetic at best and when the electorate compared their choices, they were not left with much of an option. Trusting yourself to be the best is good for self-confidence but one must realize that being perfect is only a notion. NaMo realized this and hence trusted his core research team to give him real-time and fruitful feedback. While he may have rejected many of the propositions, he definitely picked up the ones that were meaningful. Post every speech, he would take a view on which areas were strong and which needed work. Areas on improvement were identified and sorted out well before he was ready for his next speech which in best cases was only couple of hours away. When a survey revealed that people loved Modi but did not relate him to the election symbol of BJP, he made every BJP spokesperson use the badge of symbol –lotus - on their shirts. He went in to the extent of flouting election rules to ensure media could use his name and lotus in the same sentence. The guy did display a quality of grasping each opportunity to strengthen the mirage that his is. Manishankar Aiyer’s jibe of his background as “Chaiwala” – a tea seller – boomeranged badly. NaMo built up an entire channel of dialogue with public on that jibe when he started his famous “chai pe charcha” – talks over tea. Every session of that charcha reminded people of humble background of their PM candidate and took him a step forward. Priyanka Gandhi would have never thought in her dreams that her comments on way of his politics would somehow be twisted to extent where they would have a caste based context. If we look a bit backward, Sonia Gandhi’s “maut ke saudagar” – trader of death – remark was enough to create an entire state election campaign around it. While there was a 40 year old Yuvraaj of a political dynasty put forward as a youth leader - one who was allegedly Harvard educated and son of a PM who spearheaded introduction of technology – who could not use the social media to interact with public. On the other hand was a 63 year old, graduate through correspondence and weak in English, used the media with such a vigor that he seemed more progressive than the former. Be it using audio/video conferences to deal with district administrations, using technology for e-governance or 3-d conferences for conducting extended rallies, the guy leveraged every option available to take his mission forward. While most of the aura around this guy is built around his progressiveness, he never forgets what worked in classical politics. He uses the issue of Ram Temple in areas where it helps, sends Amit Shah to probably polarize electorates to certain extent and exploits confusion around his caste to the best of his ability. He is not averse to responding to his opposition in the language they accuse him and still comes out of it gracefully. He is ready to agitate our minds with aggressive stance on Pakistan and Bangladesh while extending an olive branch to other neighbors. He was pro-active in coordination with the RSS to mobilize their cadre to support his cause. He joined hands with the right partners to balance the caste equations and to carry his message of Hinduism. He was ready to pull in leaders with somewhat grey background if they could deliver what mattered – seats. In short he used every trick in the book to ensure that the classical style of politics is not forgotten and best of it is carried forward. It was all this that worked for NaMo towards creating a persona which was larger than the picture itself. BJP as a party was left behind and people came out to vote for one person – Narendra Modi. It was not the local candidates that people voted for. Many of those candidates were not known and may not be known today. It was this single man who asked for 300 lotuses and was given 336 instead. Yes the seats of NDA were swept on a large extent because of this guy. It was he because of whom people in states of Assam, Tamil Nadu, Arunachal Pradesh, Jammu and Kashmir, West Bengal and many other states voted seats for BJP where the party had negligible presence. The general elections of 2014 and how they were fought are definitely going to be things to study about and many case studies would take birth on how to handle a marketing campaign. There are lessons for owners of brands to learn on how they can take their appeal to masses. Most of these views are based on the media coverage and discussions with my friends and colleagues. So, if you disagree or think I have missed any points or have areas of improvement to offer, the comments box below is what you are looking for. If you agree, appreciation is always welcome.